John Christopher Lujack Jr. (pronounced Lu' jack; born January 4, 1925) is a former American football quarterback and 1947 Heisman Trophy winner. He played college football for the University of Notre Dame, and professionally for the Chicago Bears. Lujack was the first of several successful quarterbacks who hailed from Western Pennsylvania. Others include Pro Football Hall of Fame members Johnny Unitas, Joe Namath, Dan Marino, Jim Kelly, Joe Montana and George Blanda. Lujack was born to Alice and John, Sr., in 1925 in Connellsville, Pennsylvania, the youngest of four sons and fifth child in a family of six children. The family, which included older siblings Valentine ("Val"), Stanley ("Stan"), Victoria, Aloysius ("Allie"), and younger sister Dolores, is of Polish descent. His father, John, Sr., worked for the Pittsburgh and Lake Erie Railroad for thirty years as a boiler-maker. He was on the Connellsville High School football team from 1939 to 1941, and was also senior class president and valedictorian. He lettered in four sports; baseball, football, basketball, and track, in high school. His 1941 high school team, named the Cokers for workers in the coal milling industry who feed the ovens, went 8–0–1, but did not get to play for the WPIAL league championship because their last game, with Brownsville, ended in a 13-13 tie. People in Connellsville had wanted him to go to the United States Military Academy (Army) at West Point, going so far as to ask their local congressman for an appointment, but Lujack, a fan of Notre Dame from listening to their football radio broadcasts, had his heart set on playing in South Bend. He was the first Connellsville High School student to receive an appointment to Army. 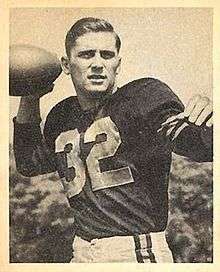 Lujack attended Notre Dame, where he was given a scholarship by Frank Leahy, from 1942 to 1943 and then 1946 to 1947. His career was interrupted for two years by World War II after his sophomore season, where he served an officer in the United States Navy. His time in the Navy was spent hunting German submarines in the English Channel as an ensign. When he returned from the Atlantic (ETO) duty he appeared on the cover of the September 29, 1947, issue of LIFE. He led the 1947 Fighting Irish to 9-0 record for his senior year, where he completed 61 passes on 109 attempts for 777 yards and also ran 139 yards on 12 carries, and won the Heisman Trophy. As he had in high school, he once again received varsity letters (called "monograms") in four sports (again baseball, football, basketball, and track) while at Notre Dame, becoming the third person to do so. He was a two-time All-American (1946 & 1947) and led Notre Dame to three national championships (1943, '46 and '47). And, in addition to winning the Heisman, he was named Associated Press Athlete of the Year. He was paid USD$17,000 for his rookie 1948 season with the Bears and $20,000 for his fourth and final season. In his rookie season he played defensive back where he had 8 interceptions for 131 yards and kicked 44 out of 46 extra points. In the summer of 1949 he starred in a radio program on ABC, The Adventures of Johnny Lujack, which was a summer time replacement for the Jack Armstrong, the All-American Boy show. It was a 30-minute program and broadcast on Monday, Wednesday, and Friday. The show was broadcast from the studios of WGN in Chicago over the Mutual Broadcasting System (MBS) and ran for 13-weeks. In the final game of the 1949 season, the 9–3 Bears defeated their hometown rivals, the Chicago Cardinals (6–5–1), by a score of 52–21 on December 11. In that game Lujack threw six touchdown passes and set an NFL record with 468 passing yards. The record was broken later by Norm Van Brocklin. His wife is the former Patricia Ann "Pat" Schierbrock, daughter of Josephine (née Wilson) and Frank H. Schierbrock. Lujack and Schierbrock were married in Davenport, Iowa at the Sacred Heart Cathedral on June 26, 1949. They have three children, Mary, Jeff, and Carol (1954–2002). Sid Luckman and George Blanda played behind Lujack in the rotation at quarterback for the 1949 and 1950 seasons. During the 1950 Chicago Bears season Lujack set an NFL record for most rushing touchdowns by a quarterback at 11. This record was tied by Tobin Rote with the Green Bay Packers in 1956, and broken by the New England Patriot's Steve Grogan in 1976. Lujack, named to the 1950 All-Pro First Team, also set a Bears record for 109 total points in a season with 11 touchdowns, 3 (out of 5) field-goals, and 34 (out of 35) extra points. That record was surpassed by Gale Sayers in 1965 with 123 total points. After four years with the Bears he returned to Notre Dame as an assistant coach for 1952 and 1953 to repay Frank Leahy as a debt of gratitude for having given him a scholarship to Notre Dame. Leahy wanted Lujack to succeed him as the head coach of the Fighting Irish, but Terry Brennan was chosen instead by Reverend Theodore Hesburgh, the university president. In 1954 he then went into the car dealership business with his father-in-law, at Lujack Schierbrock Chevrolet Company of Davenport, Iowa. He sold his dealership interest to his son-in-law in 1988. Lujack served as a television color commentator for several years, teaming with Chris Schenkel to call New York Giants games on CBS from 1958 to 1961. However, in 1962 when Ford signed on as a major sponsor and learned that Lujack was a Chevrolet dealer, he was replaced by Pat Summerall. He also worked with Jim McKay on CBS doing college football and on ABC college football telecasts in the late 1960s. On June 8, 1978, Lujack was inducted into the National Polish-American Sports Hall of Fame. In 2005 he donated $50,000 to Connellsville High School toward a new field house for the football stadium. It was later named Johnny Lujack Field House. The Johnny Lujack Training Facility was formally dedicated in 2009 and he was also inducted into the inaugural class of the Fayette County Sports Hall of Fame. He is the oldest living Heisman Trophy winner. ↑ Luczak. - Connellsville, Fayette, Pennsylvania. - 1930 United States Census. - United States Census Bureau. ↑ "Johnny Lujack", Pro-Football-Reference.com, Sports Reference LLC. 1 2 Markoe. - p.74. ↑ "1949 Chicago Bears", Pro-Football-Reference.com, Sports Reference LLC. ↑ "1950 Chicago Bears", Pro-Football-Reference.com, Sports Reference LLC. ↑ ""Where Are They Now?" Heisman Trophy Edition". lostlettermen.com. Retrieved 21 April 2012.